Born on September 24, 1919, in Chicago, Illinois (he is 98 at this writing! 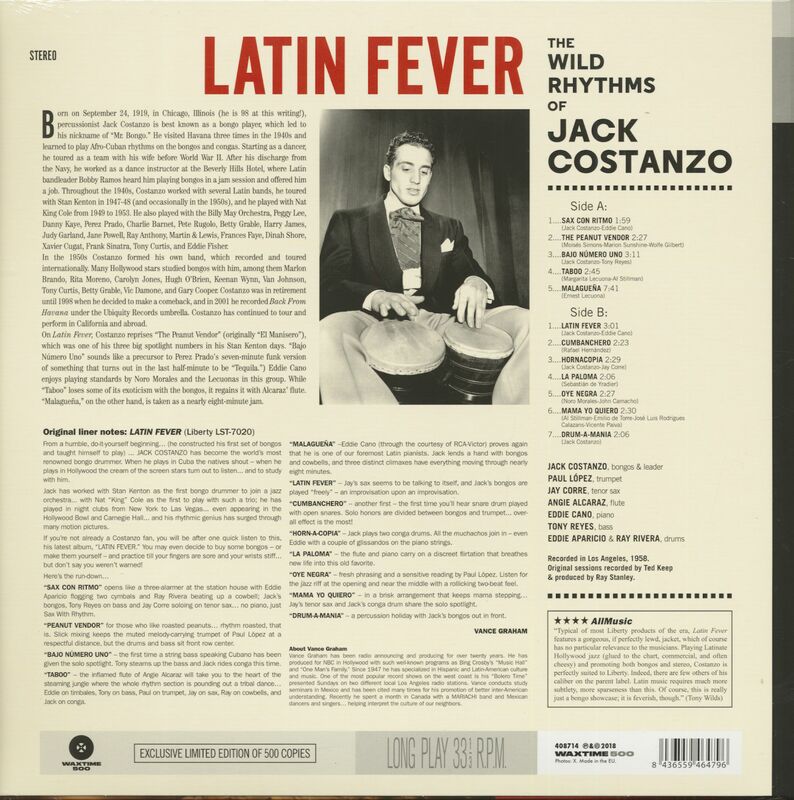 ), percussionist Jack Costanzo is best known as a bongo player, which led to his nickname of 'Mr. Bongo'. He visited Havana three times in the 1940s and learned to play Afro-Cuban rhythms on the bongos and congas. Starting as a dancer, he toured as a team with his wife before World War II. After his discharge from the Navy, he worked as a dance instructor at the Beverly Hills Hotel, where Latin bandleader Bobby Ramos heard hint playing bongos in a jam session and offered him a job. Throughout the 1940s, Costanzo worked with several Latin bands, he toured with Stan Kenton in 1947-48 (and occasionally in the 1950s), and he played with Nat King Cole from 1949 to 1953. He also played with the Billy May Orchestra, Peggy Lee, Danny Kaye, Perez Prado, Charlie Barnet, Pete Rugolo. Betty Grable, Harry James, Judy Garland, Jane Powell, Ray Anthony, Martin & Lewis, Frances Faye, Dinah Shore. Xavier Cugat, Frank Sinatra, Tony Curtis, and Eddie Fisher. In the 1950s Costanzo formed his Own band, which recorded and toured internationally. Many Hollywood stars studied bongos with him, among them Marlon Brando, Rita Moreno, Carolyn Jones, Hugh O'Brien. Keenan Wynn, Van Johnson, Tony Curtis, Betty Grable, Vic Damone, and Gary Cooper. Costanzo was in retirement until 1998 when he decided to make a comeback, and in 2001 he recorded Back From Havana under the Ubiquity Records umbrella. Costanzo has continued to tour and perform in California and abroad. 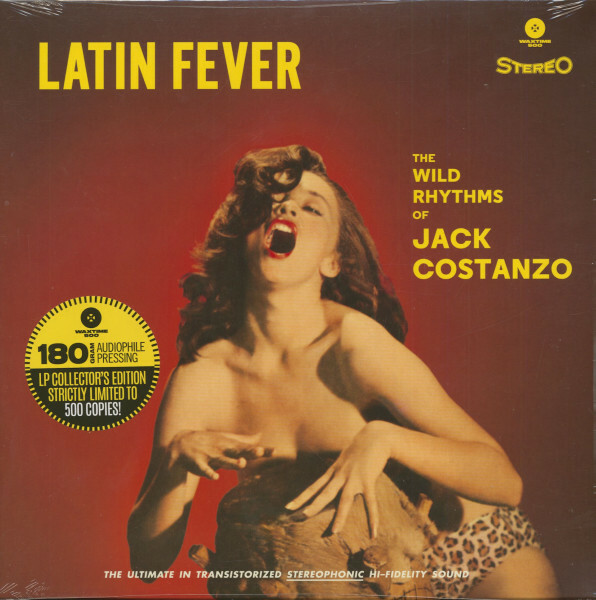 On Latin Fever, Costanzo reprises 'The Peanut Vendor' (originally 'El Manisero'), which was one of his three big spotlight numbers in his Stan Kenton days. 'Bajo Ntimero Uno' sounds like a precursor to Perez Prado's seven-minute funk version of something that turns out in the last half-minute to be 'Tequila.') Eddie Cano enjoys playing standards by Nom Morales and the Lecuonas in this group. While 'Taboo' loses some of its exoticism with the bongos, it regains it with Alcaraz' flute. 'Malaguena' on the other hand, is taken as a nearly eight-minute jam. Customer evaluation for "Latin Fever (LP, 180g Vinyl)"